Flag as shown in Dulcert’s 1339 map (other sources illustrate that the Golden Horde was known for the yellow color of the khan's flag and trappings  ). ↑ Official language since the inception of the Golden Horde, used in chancery. ↑ Especially the western Kipchak dialects, this language spoken by the majority of the inhabitants of the Black Sea steppe who were non-Mongol Turks, and those in the Khan's army. 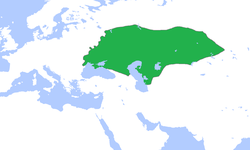 Shift from Mongol to Turkic occurred in the 1350s, or earlier, also used in chancery. The Tatar language is a Turkic language spoken by Tatars mainly located in modern Tatarstan, Bashkortostan, as well as Siberia. It should not be confused with the Crimean Tatar language which is closely related, but belongs to another, the Cuman subgroup of the Kipchak languages. Timur, sometimes spelled Taimur and historically best known as Amir Timur or Tamerlane, was a Turco-Mongol Persianate conqueror. As the founder of the Timurid Empire in and around modern-day Iran and Central Asia, he became the first ruler of the Timurid dynasty. According to John Joseph Saunders, Timur was "the product of an islamized and iranized society", and not steppe nomadic. The History of Yuan, also known as the Yuanshi, is one of the official Chinese historical works known as the Twenty-Four Histories of China. Commissioned by the court of the Ming dynasty, in accordance to political tradition, the text was composed in 1370 by the official Bureau of History of the Ming dynasty, under direction of Song Lian (1310–1381). The Jāmiʿ al-tawārīkh, is a work of literature and history, produced in the Mongol Ilkhanate in Persia. 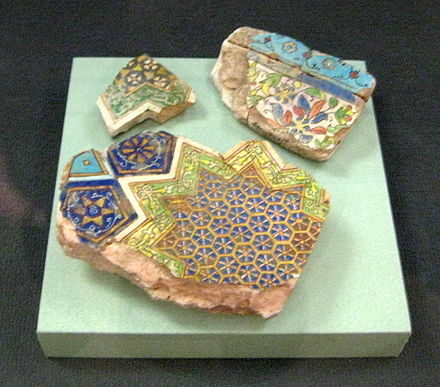 Written by Rashid-al-Din Hamadani (1247–1318) at the start of the 14th century, the breadth of coverage of the work has caused it to be called "the first world history". It was in three volumes. The surviving portions total approximately 400 pages, with versions in Persian and Arabic. The work describes cultures and major events in world history from China to Europe; in addition, it covers Mongol history, as a way of establishing their cultural legacy. At his death in 1227, Genghis Khan divided the Mongol Empire amongst his four sons as appanages, but the Empire remained united under the supreme khan. Jochi was the eldest, but he died six months before Genghis. The westernmost lands occupied by the Mongols, which included what is today southern Russia and Kazakhstan, were given to Jochi's eldest sons, Batu Khan, who eventually became the ruler of the Blue Horde, and Orda Khan, who became the leader of the White Horde. In 1235, Batu with the great general Subedei began an invasion westwards, first conquering the Bashkirs and then moving on to Volga Bulgaria in 1236. From there he conquered some of the southern steppes of present-day Ukraine in 1237, forcing many of the local Cumans to retreat westward. The military campaign against the Kypchaks and Cumans had started under Jochi and Subedei in 1216–1218 when the Merkits took shelter among them. By 1239 a large portion of Cumans were driven out of the Crimea peninsula, and it became one of the appanages of the Mongol Empire. The remnants of the Crimean Cumans survived in the Crimean mountains, and they would, in time, mix with other groups in the Crimea (including Greeks, Goths, and Mongols) to form the Crimean Tatar population. Moving north, Batu began the Mongol invasion of Rus' and for three years subjugated the principalities of former Kievan Rus', whilst his cousins Möngke, Kadan, and Güyük moved southwards into Alania. Using the migration of the Cumans as their casus belli , the Mongols continued west, raiding Poland and Hungary and culminating in the battles of Legnica and Mohi. In 1241, however, Ögedei Khan died in the Mongolian homeland. Batu turned back from his siege of Vienna to take part in disputing the succession. The Mongol armies would never again travel so far west. In 1242, after retreating through Hungary, destroying Pest in the process, and subjugating Bulgaria,  Batu established his capital at Sarai, commanding the lower stretch of the Volga River, on the site of the Khazar capital of Atil. Shortly before that, the younger brother of Batu and Orda, Shiban, was given his own enormous ulus east of the Ural Mountains along the Ob and Irtysh Rivers. After a short time, Güyük called Batu to pay him homage several times. 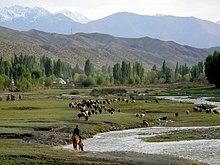 Batu sent Andrey and Alexander Nevsky to Karakorum in Mongolia in 1247 after their father's death. Güyük appointed Andrey Grand prince of Vladimir-Suzdal and Alexander prince of Kiev. In 1248, he demanded Batu come eastward to meet him, a move that some contemporaries regarded as a pretext for Batu's arrest. In compliance with the order, Batu approached, bringing a large army. When Güyük moved westwards, Tolui's widow and a sister of Batu's stepmother Sorghaghtani warned Batu that the Jochids might be his target. Güyük died on the way, in what is now Xinjiang, at about the age of forty-two. Although some modern historians believe that he died of natural causes because of deteriorating health,  he may have succumbed to the combined effects of alcoholism and gout, or he may have been poisoned. William of Rubruck and a Muslim chronicler state that Batu killed the imperial envoy, and one of his brothers murdered the Great Khan Güyük, but these claims are not completely corroborated by other major sources. Güyük's widow Oghul Qaimish took over as regent, but she would be unable to keep the succession within her branch of the family. 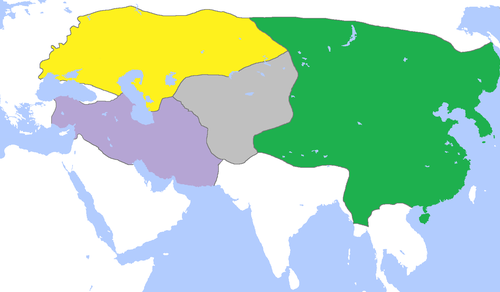 After Möngke Khan died in 1259, the Toluid Civil War broke out between Kublai Khan and Ariq Böke. While Hulagu supported Kublai, Berke threw his allegiance to Ariq Böke. He also minted coins in Ariq Böke's name. However, Berke remained neutral militarily, and after the defeat of Ariq Böke, freely acceded to Kublai's enthronement. However, some elites of the White Horde joined Ariq Böke's resistance. One of the Jochid princes who joined Hulagu's army was accused of witchcraft and sorcery against Hulagu. After receiving permission from Berke, Hulagu executed him. After that two more Jochid princes died suspiciously. 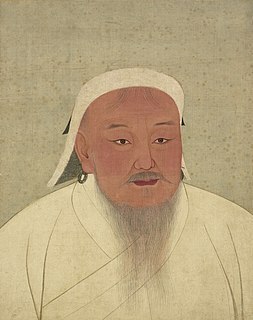 According to some Muslim sources, Hulagu refused to share his war booty with Berke in accordance with Genghis Khan's wish. Berke was a devoted Muslim who had had a close relationship with the Abbasid Caliph Al-Musta'sim, who had been killed by Hulagu in 1258. The Jochids believed that Hulagu's state eliminated their presence in the Transcaucasus. Those events increased the anger of Berke and the war between the Golden Horde and the Ilkhanate soon broke out in 1262. Ariq Böke had earlier placed Chagatai's grandson Alghu as Chagatayid Khan, ruling Central Asia. He took control of Samarkand and Bukhara. When the Muslim elites and the Jochid retainers in Bukhara declared their loyalty to Berke, Alghu smashed the Golden Horde appanages in Khorazm. Alghu insisted Hulagu attack the Golden Horde; he accused Berke of purging his family in 1252. In Bukhara, he and Hulagu slaughtered all the retainers of the Golden Horde and reduced their families into slavery, sparing only the Great Khan Kublai's men. After Berke gave his allegiance to Kublai, Alghu declared war on Berke, seizing Otrar and Khorazm. While the left bank of Khorazm would eventually be retaken, Berke had lost control over Transoxiana. 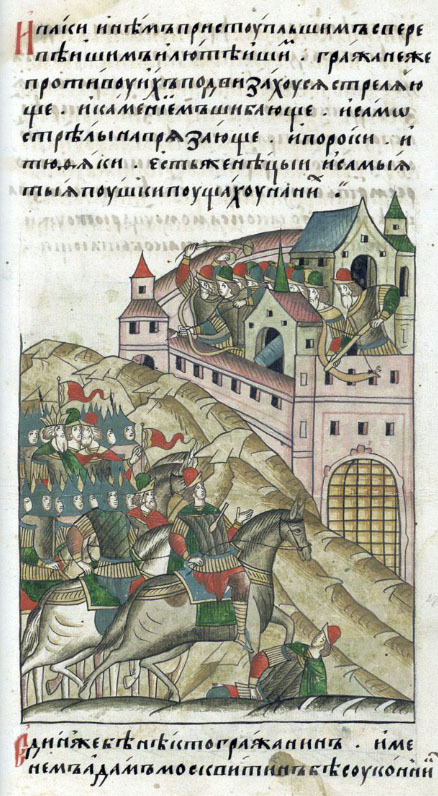 In 1264 Berke marched past Tiflis to fight against Hulagu's successor Abagha, but he died en route. 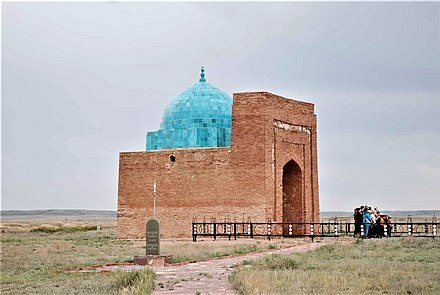 Mengu-Timur was succeeded in 1281 by his brother Töde Möngke, who was a Muslim. He made peace with Kublai, returned his sons to him, and acknowledged his supremacy. 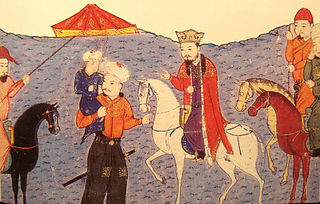 Nogai and Köchü, Khan of the White Horde and son of Orda Khan, also made peace with the Yuan dynasty and the Ilkhanate. According to Mamluk historians, Töde Möngke sent the Mamluks a letter proposing to fight against their common enemy, the unbelieving Ilkhanate. This indicates that he might have had an interest in Azerbaijan and Georgia, which were both ruled by the Ilkhans. In the 1270s Nogai savagely raided Bulgaria  and Lithuania. He blockaded Michael Asen II inside Drăstăr in 1279, executed the rebel emperor Ivailo in 1280, and forced George Terter I to seek refuge in the Byzantine Empire in 1292. In 1284 Saqchi came under the Mongol rule during the major invasion of Bulgaria, and coins were struck in the Khan's name. Smilets became emperor of Bulgaria according to the wishes of Nogai Khan, who helped his allies the Byzantines. Accordingly, the reign of Smilets has been considered the height of Mongol overlordship in Bulgaria. When he was expelled by a local boyar c. 1295, the Mongols launched another invasion to protect their protege. 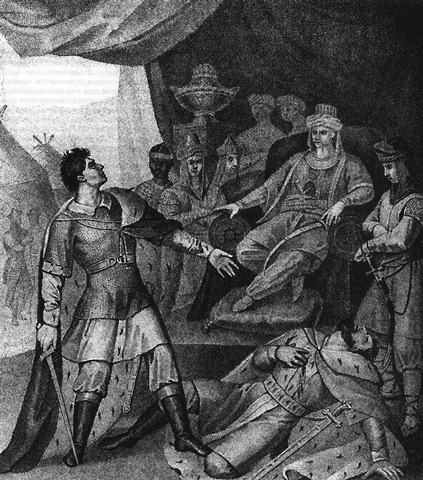 Nogai compelled Serbian king Stefan Milutin to accept Mongol supremacy and received his son, Stefan Dečanski, as hostage in 1287. 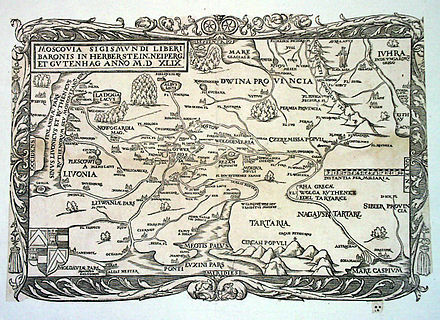 Under his rule, the Vlachs, Slavs, Alans, and Turco-Mongols lived in modern-day Moldavia. After their failed but devastating invasion of Hungary in 1285, Nogai, Talabuga, and other noyans overthrew Töde Möngke because he was not an active Khan surrounded by clerics and sheikhs. Talabuga was elected as Khan, and Töde Möngke was left to live in peace. In addition to his attack on Poland in 1287, Talabuga's army made unsuccessful attempts to invade the Ilkhanate in 1288 and 1290. The Khan arrested the Italian residents of Sarai and besieged Caffa in 1307. The cause was apparently Toqta's displeasure at the Genoese slave trade of his subjects, who were mostly sold as soldiers to Egypt. The Genoese resisted for a year, but in 1308 they set fire to their city and abandoned it. Relations between the Italians and the Golden Horde remained tense until Toqta's death. The policy of Mongol rulers regarding the Rus' was to constantly switch alliances in an attempt to keep Russia and Eastern Europe weak and divided. With the assistance of Sarai, the Grand duke Mikhail Yaroslavich won the battle against the party in Novgorod in 1316. While Mikhail was asserting his authority, his rival Yury of Moscow ingratiated himself into the favor of Uzbeg so that he appointed him chief of the Rus' princes and gave him his sister, Konchak, in marriage. After spending three years at Uzbeg's court, Yury returned with an army of Mongols and Mordvins. After he ravaged the villages of Tver, Yury was defeated by Mikhail in December 1318, and his new wife and the Mongol general, Kawgady, were captured. While she stayed in Tver, Konchak, who converted to Christianity and adopted the name Agatha, died. 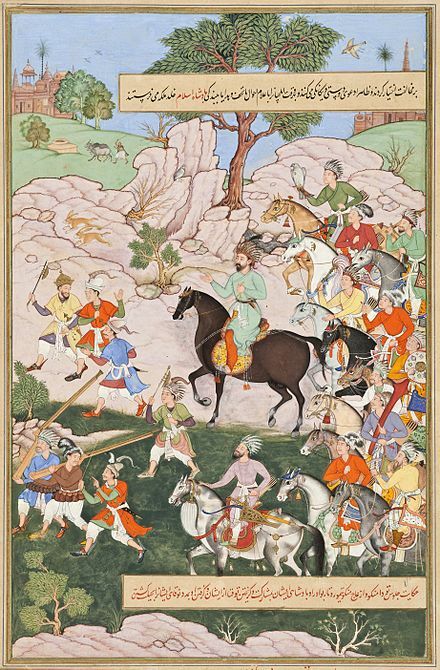 Mikhail's rivals suggested to Uzbeg Khan that he had poisoned the Khan's sister and revolted against his rule. Mikhail was summoned to Sarai and executed on November 22, 1318. In 1322, Mikhail's son, Dmitry, seeking revenge for his father's murder, went to Sarai and persuaded the Khan that Yury had appropriated a large portion of the tribute due to the Horde. Yury was summoned to the Horde for a trial, but he was killed by Dmitry before any formal investigation. Eight months later, Dmitry was also executed by the Horde for his crime. Uzbeg allowed the Genoese to settle in Crimea after his accession, but the Mongols sacked their outpost Sudak in 1322 when the Christians defied the Muslims in the city. The Genoese merchants in the other towns were not molested. Pope John XXII requested Uzbeg to restore Roman Catholic churches destroyed in the region. Thus, the Khan signed a new trade treaty with the Genoese in 1339 and allowed them to rebuild the walls of Kaffa. In 1332 he had allowed the Venetians to establish a colony at Tanais on the Don. A decree, issued probably by Mengu-Timur, allowing the Franciscans to proselytize, was renewed by Uzbeg in 1314. The Golden Horde invaded the Ilkhanate under Abu Sa'id in 1318, 1324, and 1335. Uzbeg's ally Al-Nasir refused to attack Abu Sa'id because the Ilkhan and the Mamluk Sultan signed a peace treaty in 1323. In 1326 Uzbeg reopened friendly relations with the Empire of the Great Khan and began to send tributes thereafter. From 1339 he received annually 24,000 ding in Yuan paper currency from the Jochid appanages in China. When the Ilkhanate collapsed after Abu Sa'id's death, its senior-beys approached Uzbeg in their desperation to find a leader, but the latter declined after consulting with his senior emir, Qutluq Timür. The Black Death of the 1340s was a major factor contributing to the economic downfall of the Golden Horde. Janibeg abandoned his father's Balkan ambitions and backed Moscow against Lithuania and Poland. He also asserted Jochid dominance over the Chagatai Khanate and conquered Tabriz, ending Chobanid rule there in 1356. After accepting the surrender of the Jalayirids, Janibeg boasted that three uluses of the Mongol Empire were under his control. The Polish King, Casimir III the Great, submitted to the Horde and undertook to pay tribute in order to avoid more conflicts. [ full citation needed ]  The seven Mongol princes were sent by Janibeg to assist Poland. [ verification needed ]  Following the subsequent assassination of Janibeg, the Golden Horde quickly lost Azerbaijan to the Jalayir king Shaikh Uvais in 1357. 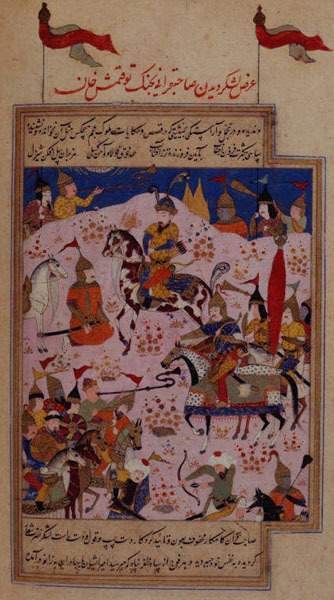 Following the assassination of Berdibek by his brother in 1359, the Khanate sank into prolonged internecine war, in which sometimes as many as four Khans vied for recognition by the emirs and for possession of major cities like Sarai, Qirim, and Azaq. After the overthrow of their nominal suzerain, Yuan Emperor Toghan Temür,  the Golden Horde lost touch with Mongolia and China. White Horde descendants of Orda and Tuqa-Timur carried on generally free from trouble until the late 1370s. Urus Khan of the White Horde took Sarai and reunited most of the Horde from Khorazm to Desht-i-Kipchak in 1375. 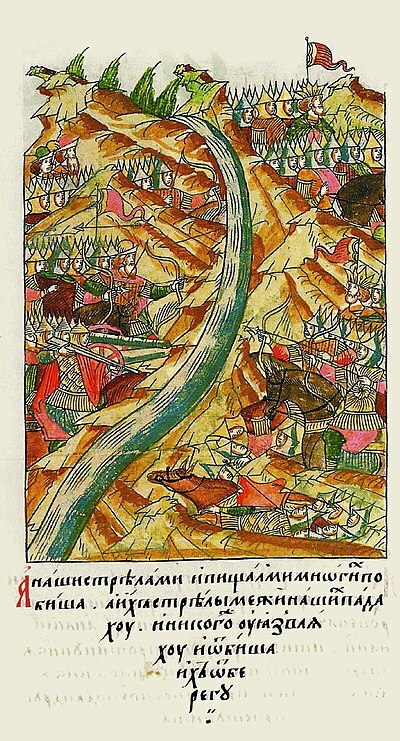 After Mamai's defeat, Tokhtamysh restored the dominance of the Golden Horde over Russia by attacking Russian lands in 1382. He besieged Moscow on August 23, but Muscovites beat off his attack, using firearms for the first time in Russian history. On August 26, two sons of Tokhtamysh's supporter Dmitry of Suzdal, Dukes Vasily of Suzdal and Semyon of Nizhny Novgorod, who were present in Tokhtamysh's forces, persuaded the Muscovites to open the city gates, promising that their forces would not harm the city. This allowed Tokhtamysh's troops to burst in and destroy Moscow, killing 24,000 people. Tokhtamysh also crushed the Lithuanian army at Poltava in the next year. Władysław II Jagiełło, Grand Duke of Lithuania and King of Poland, accepted his supremacy and agreed to pay tribute in turn for a grant of Rus' territory. For another century, Russia was forced back under the Tatar yoke. When Tokhtamysh fled, Urus Khan's grandson, Temür Qutlugh, was chosen Khan in Sarai, and Koirijak was appointed sovereign of the White Horde by Timur. Temür Qutlugh's chief emir Edigu was the real rulers of the Golden Horde. 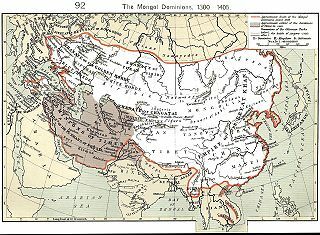 Genghis Khan assigned four Mongol mingghans: the Sanchi'ud (or Salji'ud), Keniges, Uushin, and Je'ured clans to Jochi. By the beginning of the 14th century, noyans from the Sanchi'ud, Hongirat, Ongud (Arghun), Keniges, Jajirad, Besud, Oirat, and Je'ured clans held importants positions at the court or elsewehere. There existed four mingghans (4,000) of the Jalayir in the left wing of the Ulus of Jochi (Golden Horde). The population of the Golden Horde was largely a mixture of Turks and Mongols who adopted Islam later, as well as smaller numbers of Finno-Ugrians, Sarmato-Scythians, Slavs, and people from the Caucasus, among others (whether Muslim or not). Most of the Horde's population was Turkic: Kipchaks, Cumans, Volga Bulgars, Khwarezmians, and others. The Horde was gradually Turkified and lost its Mongol identity, while the descendants of Batu's original Mongol warriors constituted the upper class. They were commonly named the Tatars by the Russians and Europeans. Russians preserved this common name for this group down to the 20th century. Whereas most members of this group identified themselves by their ethnic or tribal names, most also considered themselves to be Muslims. Most of the population, both agricultural and nomadic, adopted the Kypchak language, which developed into the regional languages of Kypchak groups after the Horde disintegrated. The Golden Horde's elites were descended from four Mongol clans, Qiyat, Manghut, Sicivut and Qonqirat. Their supreme ruler was the Khan, chosen by the kurultai among Batu Khan's descendants. The prime minister, also ethnically Mongol, was known as "prince of princes", or beklare-bek. The ministers were called viziers . Local governors, or basqaqs , were responsible for levying taxes and dealing with popular discontent. Civil and military administration, as a rule, were not separate. 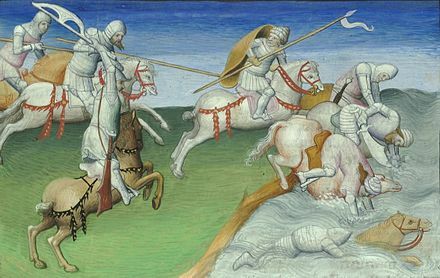 Mongols chase Hungarian king from Mohi, detail from Chronicon Pictum . 1 2 3 Kołodziejczyk (2011), p. 4. ↑ Zahler, Diane (2013). The Black Death (Revised Edition). Twenty-First Century Books. p. 70. ISBN 978-1-4677-0375-8. ↑ German A. Fedorov-Davydov The Monetary System of The Golden Horde*. Translated by L. I. Smirnova (Holden). Retrieved: 14 July 2017. ↑ Perrie, Maureen, ed. (2006). The Cambridge History of Russia: Volume 1, From Early Rus' to 1689. Cambridge University Press. p. 130. ISBN 978-0-521-81227-6. 1 2 "Golden Horde". Encyclopædia Britannica . 2007. Also called Kipchak Khanate Russian designation for Juchi's Ulus, the western part of the Mongol Empire, which flourished from the mid-13th century to the end of the 14th century. The people of the Golden Horde were mainly a mixture of Turkic and Uralic peoples and Sarmatians & Scythians and, to a lesser extent, Mongols, with the latter generally constituting the aristocracy. Distinguish the Kipchak Khanate from the earlier Cuman-Kipchak confederation in the same region that had previously held sway, before its conquest by the Mongols. ↑ Atwood (2004), p. 201. ↑ Gleason, Abbott (2009). A Companion to Russian History. John Wiley & Sons. p. 82. ISBN 978-1-4443-0842-6. ↑ "рЕПЛХМ гНКНРЮЪ нПДЮ - НЬХАЙЮ РНКЛЮВЮ 16 ЯРНКЕРХЪ (мХК лЮЙЯХМЪ) / оПНГЮ.ПС - МЮЖХНМЮКЭМШИ ЯЕПБЕП ЯНБПЕЛЕММНИ ОПНГШ". Proza.ru. Retrieved 2014-04-11. ↑ Ostrowski, Donald G. (Spring 2007). "Encyclopedia of Mongolia and the Mongol Empire, and: The Mongols and the West, 1221–1410, and: Daily Life in the Mongol Empire, and: The Secret History of the Mongols: A Mongolian Epic Chronicle of the Thirteenth Century (review)". Kritika: Explorations in Russian and Eurasian History. Project MUSE. 8 (2): 431–441. doi:10.1353/kri.2007.0019. ↑ May, T. (2001). "Khanate of the Golden Horde (Kipchak)". North Georgia College and State University. Archived from the original on December 14, 2006. ↑ Spinei, Victor (2009). The Romanians and the Turkic Nomads North of the Danube Delta from the Tenth to the Mid-Thirteenth Century. BRILL. p. 38. ISBN 978-90-04-17536-5. ↑ Atwood (2004), p. 41. ↑ Allsen (1985), pp. 5-40. ↑ Grekov, B. D.; Yakubovski, A. Y. (1998) . The Golden Horde and its Downfall (in Russian). Moscow: Bogorodskii Pechatnik. ISBN 978-5-8958-9005-9. 1 2 Sinor, Denis (1999). "The Mongols in the West". Journal of Asian History. Harrassowitz Verlag. 33 (1): 1–44. JSTOR 41933117. ↑ Martin (2007), p. 152. ↑ Atwood (2004), p. 213. ↑ Jackson (2014), pp. 123–124. ↑ Jackson (2014), p. 202. ↑ Jackson, Peter (1995). "The Mongols and Europe". In Abulafia, David. The New Cambridge Medieval History: Volume 5, C.1198-c.1300. Cambridge University Press. p. 709. ISBN 978-0-521-36289-4. ↑ Barthold, W. (2008) . Turkestan Down to the Mongol Invasion. ACLS Humanities E-Book. p. 446. ISBN 978-1-59740-450-1. ↑ Biran, Michal (2013). Qaidu and the Rise of the Independent Mongol State In Central Asia. Taylor & Francis. p. 52. ISBN 978-1-136-80044-3. ↑ Man, John (2012). Kublai Khan. Transworld. p. 229. ISBN 978-1-4464-8615-3. ↑ Saunders, J. J. (2001). The History of the Mongol Conquests. University of Pennsylvania Press. pp. 130–132. ISBN 978-0-8122-1766-7. ↑ Amitai-Preiss, Reuven (2005). Mongols and Mamluks: The Mamluk-Ilkhanid War, 1260-1281. Cambridge University Press. pp. 88–89. ISBN 978-0-521-52290-8. ↑ Zenkovsky, Serge A.; Zenkovsky, Betty Jean, eds. (1986). The Nikonian Chronicle: From the year 1241 to the year 1381. Kingston Press. p. 45. ISBN 978-0-940670-02-0. ↑ Vernadsky, George; Karpovich, Michael (1943). A History of Russia: The Mongols and Russia, by George Vernadsky. Yale University Press. p. 172. ↑ Allsen (1985), p. 21. ↑ Curta, Florin (2006). Southeastern Europe in the Middle Ages, 500-1250. Cambridge University Press. p. 414. ISBN 978-0-521-81539-0. ↑ Howorth (1880), p. 130. ↑ Spuler (1943), p. 78. ↑ Barthold, V.V. Four Studies on Central Asia. Translated by Minorsky, V.; Minorsky, T. Brill. p. 127. ↑ Grousset, René (1970). The Empire of the Steppes: A History of Central Asia. Rutgers University Press. p. 335. ISBN 978-0-8135-1304-1. ↑ Boyle, J. A. (1968). "Dynastic and Political History of the Il-Khans". In Boyle, J. A. The Cambridge History of Iran. Cambridge University Press. p. 374. ISBN 978-0-521-06936-6. 1 2 Jackson (2014), p. 204. ↑ Spuler (1943), p. 84. ↑ Vásáry, István (2005). Cumans and Tatars: Oriental Military in the Pre-Ottoman Balkans, 1185–1365. Cambridge University Press. p. 91. ISBN 978-1-139-44408-8. ↑ DeWeese, Devin (2010). Islamization and Native Religion in the Golden Horde: Baba TŸkles and Conversion to Islam in Historical and Epic Tradition. Penn State Press. p. 99. ISBN 978-0-271-04445-3. ↑ Martin (2007), p. 175. ↑ Fennell, John (1988). "Princely Executions in the Horde 1308–1339". Forschungen zur Osteuropaischen Geschichte. 38: 9–19. ↑ Allsen, Thomas T. (2006). The Royal Hunt in Eurasian History. University of Pennsylvania Press. p. 256. ISBN 978-0-8122-0107-9. ↑ Atwood (2004), "Golden Horde". ↑ Rowell, S. C. (2014). Lithuania Ascending. Cambridge University Press. p. 100. ISBN 978-1-107-65876-9. ↑ Zdan, Michael B. (June 1957). "The Dependence of Halych-Volyn' Rus' on the Golden Horde". The Slavonic and East European Review . 35 (85): 521–522. JSTOR 4204855. ↑ Jackson (2014), p. 211. ↑ Great Soviet Encyclopedia , 3rd edition, Entry on "Московское восстание 1382"
↑ Howorth (1880), p. 287. ↑ "Russian Interaction with Foreign Lands". Strangelove.net. Archived from the original on 2009-01-18. Retrieved 2014-04-11. ↑ Kołodziejczyk (2011), p. 66. ↑ Blair, Sheila; Art, Nasser D. Khalili Collection of Islamic (1995). جامع التواريخ: Rashid Al-Din's Illustrated History of the World. Nour Foundation. p. 212. ISBN 978-0-19-727627-3. ↑ Halperin, Charles J. (1987). 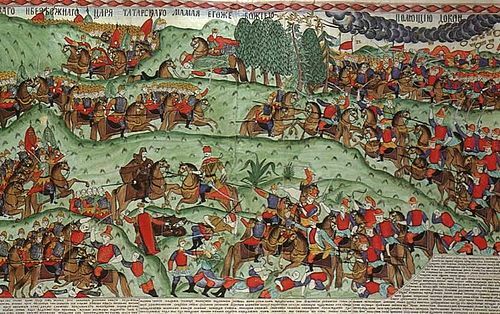 Russia and the Golden Horde: The Mongol Impact on Medieval Russian History. Indiana University Press. p. 111. ISBN 978-0-253-20445-5. ↑ Jackson, Peter (1978). The Dissolution of the Mongol Empire. Harrassowitz. pp. 186–243. Wikimedia Commons has media related to Golden Horde . Sarai was the name of two cities, which were successively capital cities of the Golden Horde, the Mongol kingdom which ruled much of Central Asia and Eastern Europe, in the 13th and 14th centuries. SartaqKhan was the son of Batu Khan and Regent Dowager Khatun Boraqchin of Alchi Tatar. Sartaq succeeded Batu as khan of the Golden Horde. Boroldai, also known as Burundai, was a notable Mongol general of the mid 13th century. He participated in the Mongol invasion of Russia and Europe in 1236-1242. According to Rashid-al-Din Hamadani (1247–1318), Genghis Khan's eldest son, Jochi, had nearly 40 sons, of whom he names 14. 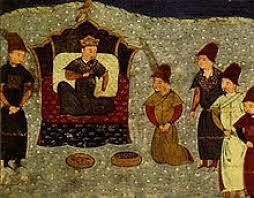 When he died, they inherited their father's dominions as fiefs under the rule of their brothers, Batu Khan, as supreme khan and Orda Khan, who, although the elder of the two, agreed that Batu enjoyed primacy as the Khan of the Golden Horde.